Our thanks also go out to so many local government officials, medical services personnel and those people manning vital public services, including the evacuation centres. In some cases, there are no local officials left alive to respond to the desperate attempts from those outside the region who are trying to establish contact. We are also greatly saddened by the tragic loss of lives of the people who lived along the coast, including many elderly who were unable to escape the tsunami in time. For those who escaped, they have lost their homes, villages and towns and face the prospect of life in evacuation centres, then perhaps temporary accommodation as the rebuilding efforts begin. Their way of life has been destroyed and they will have to start everything anew. It is hard to imagine how they feel. We also would like to express our sincere gratitude to the personnel of the Japan Self Defence Force. Around 100,000 of them have been mobilized and are in the disaster zone, rescuing those still alive and taking care of the dead with honour and respect. Their work will continue in the days, weeks and months that follow. We praise their courage. The authorities have worked their utmost to cope with what Prime Minister Kan described as the “the worst crisis” in the postwar history of Japan. It is clear that many officials have slept little since the earthquake. They are to be commended for their efforts and for each and every tough decision they have had to make. The news media has also done its best to cover events and reassure the survivors, many of whom are traumatized. Across the region, people are still struggling. Millions are without electricity, gas and water. From today, because of the short-fall caused by the nuclear accidents, planned electricity power cuts are being implemented to reduce the demand load across nine prefectures in the Kanto region. These may continue for weeks but they are a small price to pay for such a massive tragedy. 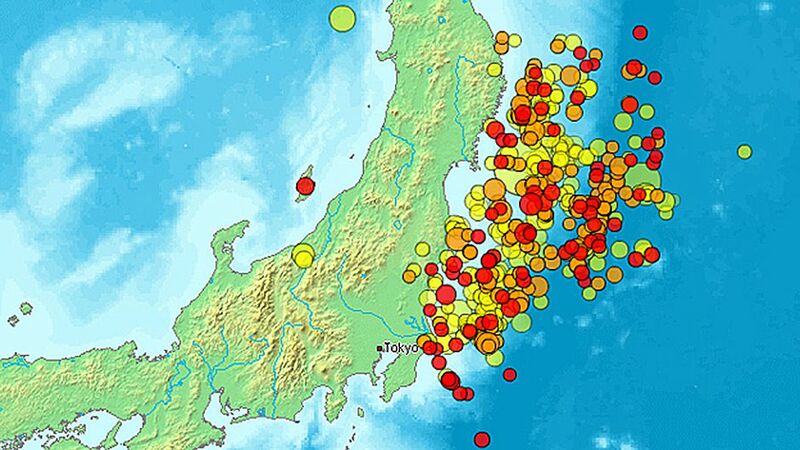 Even as we write this article, powerful aftershocks (such as the one at 10 a.m. JST of magnitude 6.2) are still occurring and shaking the offices of the United Nations University (UNU). Although the UNU Media Centre where Our World 2.0 is produced has been largely unaffected to date, other offices at higher levels in the UNU building were not so lucky and suffered minor damage. Authorities have warned that there is a 70% chance of a magnitude 7 quake in the next three days, while moderately large aftershocks are occurring every couple of hours. On that basis, we expect there will be some disruptions to our work over the foreseeable future and we ask for your understanding until our normal publishing schedule can resume. For many in the region, life and work continues as near normal as possible. People are catching the daily train as usual, working in their offices, factories and shops, and picking up our kids from school. For others however, power cuts have disrupted train lines, petrol rationing is taking place and various food stuffs have sold out in the supermarkets, or have been redirected to help the survivors. The Tragic Tohoku-kanto Earthquake and Tsunami by Brendan Barrett is licensed under a Creative Commons Attribution-NonCommercial-ShareAlike 3.0 Unported License. Thank you for putting in words what so many of us are feeling. Abiding concern and wrenching sorrow render one all but speechless. “All of them will be in our hearts and thoughts forever.” Yes, that says it. We are on the other side of the world but our hearts have been in our throats since news filtered through. Speechless is right. So is helpless. We’ve donated to the Red Cross, but let us know if there are other places our money can also go. I am glad to know you are all ok and safe. We all have been following the news and updates, and we appreaciate you still have enthusiam to let us know what is happining over there. The Japonese people are strong and we hope the best for you. Thank you, Brendan and Mark, for summarizing so well all this extraordinary effort that we witness in your article. I firmly believe Japan will not only survive, it will succeed. No country in the world, facing the magnitude of such triple disaster, would have been able to save so many of its citizens. and it has been understood well that we are severe more than considering it. So well put! Thank you both for your compassion, eloquence and fortitude during these troubled times. It’s so refreshing to read this outpouring of gratitude and understanding.